Finistère in Brittany is the most westerly part of France. 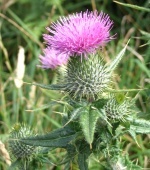 It is bordered by the English Channel and the Atlantic Ocean on more than 1200 km. From the side of the sea, you will discover sumptuous coasts that have been shaped for million of years by the whims of the ocean. Further inland, you will be charmed by the diversity and the outstanding beauty of the Breton landscapes. As soon as you arrive, you will not resist the temptation to go for a walk, to do water activities or, why not, to simply laze on the beach. Your stay in the region will give you several opportunities to experience the Breton customs and traditions. Moreover, you can take advantage of a rich and various cultural heritage and you will certainly enjoy attending the numerous festivals and events organized all year round. Finally, the gastronomy will not be forgotten with its myriad of delicious local products to taste. Porspoder is a charming small town of about 1600 inhabitants located in Pays d’Iroise* at the extreme tip of Finistère. It is characterized by a seaside dotted with little lovely coves, shores and white sand beaches. Inland, the nature always predominates and harmonizes perfectly with some witnesses of our past, such as megaliths (menhirs, dolmens), chapels, manor houses, typical houses, etc. * Community of 20 communes (districts). 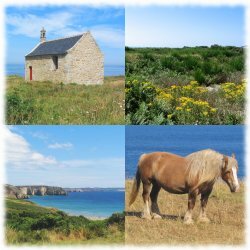 There are many walks to explore around the gîte and some of them will bring you directly to the coast. Hikers will note the proximity of the French well-known long distance rambling path "Sentier des douaniers" (GR 34). Bike enthusiasts will be pleased to know that they can request a list of cycle circuits at the Porspoder Tourist Office. Take advantage of your presence in Brittany to taste local products and culinary specialities. You will easily find them at the grocery, at the open-air market or at the restaurant. Charcuterie: ham, pâtés, terrines, andouilles, etc. Fruits and vegetables: strawberries, tomatoes, cauliflower, artichoke, etc. Fishes and seafood: crab, lobster, langoustines, oysters, etc. Cakes and biscuits: kouign amann (sweet buttery pastry), far breton, galettes bretonnes, etc. 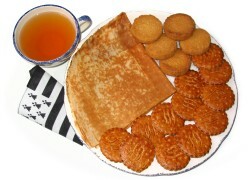 Breton crêpes made of wheat flour, buckwheat, etc, filled with savoury or sweet items. Drinks: cider (to accompany your crêpes), local beers and the famous Chouchenn (drink made from fermented honey). The Kig ha farz, a speciality from North Finistère made of a batter of flour, milk and eggs, the whole lot is then poured into a cloth bag and cooked in a vegetable pot-au-feu. Discover Ouessant (Ushant) or Molène. Outstanding islands accessible from Brest or from Le Conquet all year long and from Lanildut on certain days during the summer.